by Anne Willan, Dorling Kindersley publishing, first American edition, 1995. Hardback with DJ, 127 pages. "The ultimate step-by-step guide to mastering today's cooking -- with success every time!" trumpets the DJ description. From recipes like Split-top White Bread to French Baguette to Cheese Brioche to Onion and Walnut Crown to Yorkshire Yule Bread, and a couple of neat recipes for pizza and focaccia, La Willan, as usual, comes through. The rest is up to you and me. Color step-by-step preparation photos throughout. Not easy to find. VG+/VG+. 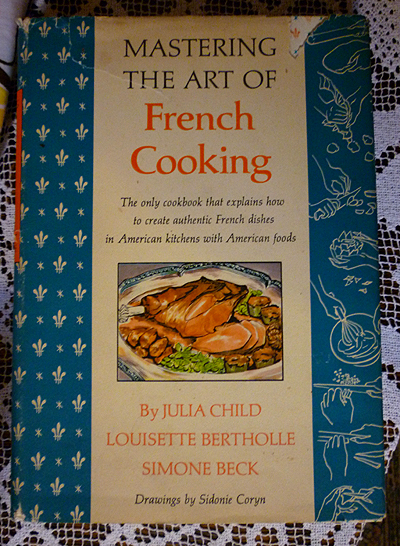 The signed Julia Child cookbook is excellent and I’m very pleased, so thanks again. The Victory Garden Cookbook is in better condition than I expected. Should you run into anther copy, let me know.